Braley Duckworth and Beckett Scott go for thrills and chills on the slope at Ralph Steyer Park Sunday afternoon. I don’t often quote bible verses but one that speaks to me as a photographer is, “This is the day the Lord has made; let us rejoice and be glad it.” – Psalm 118:28. I figure that whatever the day brings is what it brings. While a part of my job is to cover an accident or document a disruptive or disturbing event, my personal challenge is to capture images that celebrate the day. For the most part, this is just a matter of attitude. There are generally far more good things going on in our communities than bad. Another motto that I live by is, bad weather – or at least interesting weather- makes good pictures. And lately we have had a lot of interesting weather. Few can complain about the fall weather up until last week. I know many have watched some gorgeous sunsets and sunrises this fall, because many nice shots have been posted on Facebook. The weather conditions have been excellent for farmers and the majority of the harvest is in the bin. I have taken many more pictures of farmers harvesting soybeans and corn than we have had room to run in the paper. The weather could not have been nicer for Halloween this year. Neighborhood streets were filled with trick and treaters strolling about without having to hide costumes under heavy parkas. The weather was also near perfect for fall sports. There were very few contests where I had to dig out a heavy coat and gloves or put on an extra pair of socks. On some days the weather was too warm – and I have pictures of state championship cross country runners suffering from heat exhaustion to prove it. But it appears that the balmy breezes are gone and we are in the clutches of the Polar Vortex. My only real regret is that the frigid weather didn’t hold off until after November 11. For the third year in a row, the Veterans Day ceremony was moved from the Veteran’s Plaza to the Blair American Legion hall next door. Fortunately the Legion hosted a luncheon following the event with plenty of hot soup to go around. While we never know for sure when the first snow will fall, there are always the usual consequences. It seems to take one or two early storms for driver’s to remember how to drive on ice and snow. And, as usual, I neglected to dig out my snow blower or get fresh gas for it until after the first snow. But weather is neither good nor bad. It is what it is. We just need to be prepared for it, and try to keep a positive attitude. Hopefully many were able to enjoy the Saturday snowstorm over a leisurely cup of coffee without having to rush into work or hurry out to do weekend chores. By mid morning Sunday, the sun was bright and the wind was calm, and my wife Kris and I enjoyed a pleasant walk through snow covered paths at Black Elk/Neihardt Park. 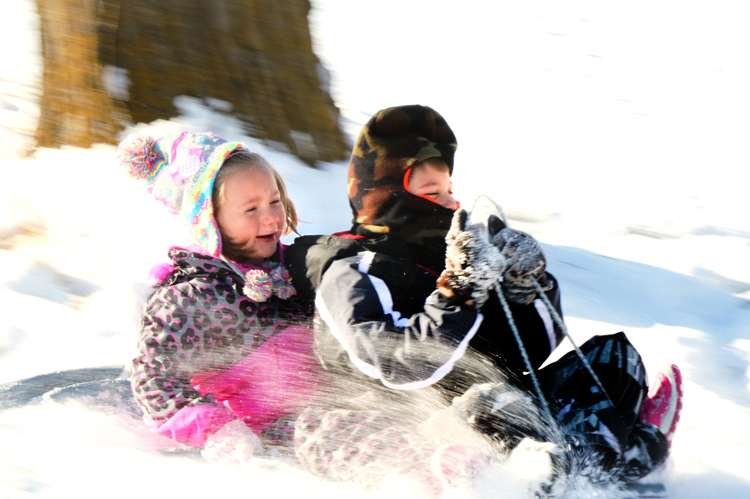 By Sunday afternoon kids were bundled up and sledding down the hill at Ralph Steyer Park. This week Blair businesses will host the annual Sugarplum Festival. Last year a light snow shower added to the festive spirit of the evening. By Thursday, temperatures should moderate, and maybe we will all be acclimated to the seasonal weather. , so we might as well do our best to enjoy it. Dig out those warm clothes, and join the families who will be making the rounds of local shops in down town Blair for the Sugarplum Festival. Let’s celebrate. 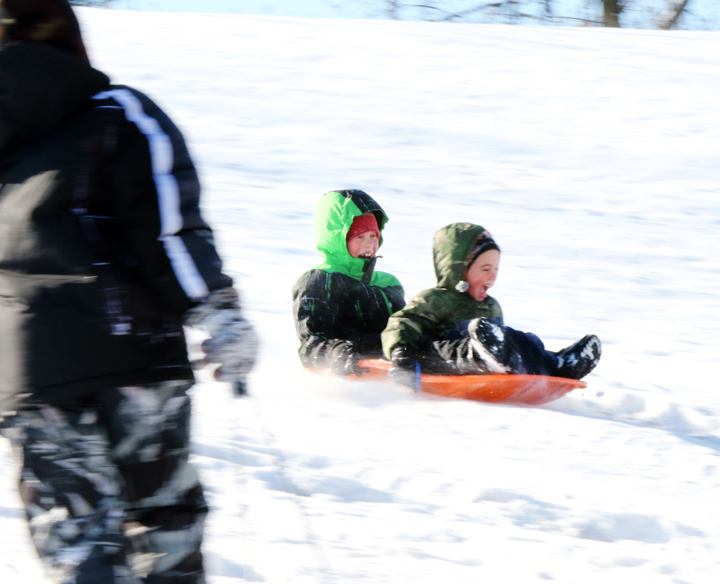 McCoy and Tommy Scott sled down the hill at Ralph Steyer Park on Sunday. Kobe Duckworth with saucer climbs the hill while McCoy and Tommy Scott slide down at Ralph Steyer Park Sujday afternoon.